Bacchus was the Roman name of the God of Wine and Ecstacy also known as Dionysus and this stunning plaque captures his image. Bacchus was the Roman name given to the God of Wine and Ecstasy, whom the Greeks knew as Dionysus. Dionysos was one of the old, wild agricultural Gods of Thrace and Phrygia. His mother, Semele, is associated with the Phrygian Earth Goddess Zemelo. 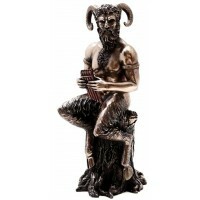 He is sometimes associated with Pan and the pagan Horned God. Though He is credited with discovering grapes and the art of winemaking, Dionysus was the God of more than Wine. He is the god of the wilds not the wilds of visible nature where Artemis reigns, but the wilds that extend so far and smile so deep in the secret regions of the human personality. Within the heart of the worship of Dionysus lies the recognition of humanity's need for occasional release from the bonds of custom and respectability. To resist and deny Dionysus and the wild side is to reject joy and often such a rejection incurs sad consequences. The rites of Dionysus were introduced into Athens by Peisistratus in the mid-6th Century BCE. His temple was built at the Acropolis and His priests and priestesses were accompanied by masked performers of the God's stories who were called tragodoi (literally "goat singers") and this was the origin of Greek Tragedy and thus of Western Theatre. Dionysian masks were often used as antefixes on the walls of temples. This image comes from Triere, in the Moselle wine country of Germany, where annual festivals blessing the grape crop have been held since ancient times. This replica is cast from a mold used for making the sacred honeycakes in the festival. The original piece is over 2,000 years old. Here it is rendered in cold cast resin with antique stone finish. It is about 6 inches in diameter. Item Number: MT-BACPQ | Approximate Size (Inches): 0.50 wide x 6.00 deep x 6.00 high | Approximate Shipping Weight: 2.00 lbs.